Police officers carrying union flags and flares gather outside the French justice ministry in Paris, part of police protests across France to demand better working conditions, Oct. 14, 2015. Thousands of police protested outside France's justice ministry for the first time in decades on Wednesday to denounce a lack of resources and what they say is inadequate judicial support for their law enforcement and working conditions. The protest was billed as the broadest showing of discontent within the police since 1983, when then-Justice Minister Robert Badinter faced similar protests and accusations of laxity after gangsters killed two police officers. This time, the discontent came to a head a week after a prisoner who was granted a brief out-of-jail permit seriously wounded an officer in a shootout in Seine-Saint-Denis on the northern edge of Paris. "There's real anger here" over unsafe working conditions, said police union representative Gregory Goupil. A string of recent decisions to let criminals out of jail or free suspects from custody has brought frustration to a boil. "There has been a breakdown between police and the justice system," Angelo Bruno, of the Unite-SGP union, told the Associated Press. "Too often, we are arresting the same people over and over." Beyond the protest in Paris' chic Place Vendome square – home to the justice minister's office and occasionally the scene of heists at luxury jewelry shops – rallies also were being organized in other parts of the country. The Paris protest was supported by the whole range of police unions, which local media interpreted as a sign that Justice Minister Christiane Taubira – often accused of being too soft on law and order – was in danger of losing her job. Former Prime Minister Francois Fillon joined the fray to criticize Socialist President Francois Hollande. "He must heed the pleas from the police and the French people, who all denounce the lack of authority," Fillon said. 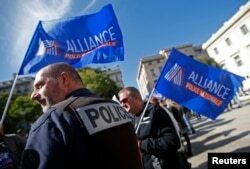 French police, holding labor union banners, rally at the courthouse in Marseille as part of a national protest against what they contend is inadequate judicial support, Oct. 14, 2015.